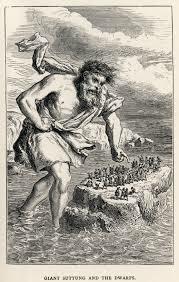 Norse mythology which is also known as Germanic mythology is a not just a myth, it is a religion and it was practiced by the Vikings who lived in the Scandinavian countries in the Viking age, but it was also practiced by the Germanic people. Norse mythology is polytheistic which means worshiping in multiple Gods and Goddesses. The Vikings believed that there are two branches of Gods the Æsir and the Vanir but they also believed in other mythical beings such as giants, dwarfs, and other creatures. You may have heard some of the Gods or Goddesses before. "Angerboda" Norse	 [Anguish-creating]. A giantess; mother of the Fenris-wolf by Loke. Norse. "Arvaka" Norse	 Aka. Aarvak, [Early awake]. The name of one of the horses of the Sun. Norse.